Salesforce CEO Marc Benioff kicked off Dreamforce 2015 by introducing two new platforms: Lightning and Thunder. Both platforms help companies connect with customers. Benioff highlights that the computing revolution has increased the number and types of devices that connect to the internet and to each other. From the personal computers to smartphones to Internet of Things (IoT) devices, there are now over a trillion different customer interactions. This could be customers using a smartphone or connecting to their smart cars, connected toothbrush or smart home. At the core of this, and behind every interaction, Benioff said, is a customer. To connect to customers are Lightning and Thunder. Earlier this summer, Salesforce co-founder Parker Harris had previewed Lightning to techradar, and now the platform is official for all customers. Lightning brings the Salesforce1 mobile experience to the desktop, which means a responsive, modern UI with smart analytics. To enable Lightning, all you'll need to do is click on the Lightning experience after you log into your Sales Cloud. Lightning helps salespeople sell more by giving them more information at a glance, whether that's a chart or graph, visualization tools, or predictive data. Lightning is available to small businesses as well as to enterprise customers using Salesforce's enterprise cloud. Lightning also has smart components that users can add and use in the interface. These components come from third-party developers and act like apps. Additionally, Lightning will also get a plugin to integrate with Gmail in the browser. Unfortunately, as Harris points out, not every salesperson is privileged enough to get an assistant with an assistant unlike Benioff. To help salespeople sell more, Salesforce is introducing a product that help users easily schedule calendar appointments or pull up customer contact information. 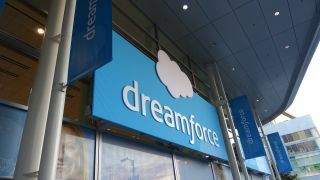 At Dreamforce, Harris showed off new a new email and calendar apps based on the company's relationship intelligence technology. This IQ technology sifts through massive amounts of data to alert salespeople on when to call a customer back and who to call to close a deal. The Salesforce IQ software essentially sits on top of your productivity software to build a map of who you're talking with and when things are due. It can automatically enter information into your emails and calendars to save you time. The next new platform Salesforce introduced is called Thunder, a platform that powers the IoT cloud. Thunder helps users capture IoT events, automatically trigger 1-to-1 real-time rules and engage customers. With Thunder, Salesforce announced that it is partnering with Microsoft, and that Microsoft is its first customer. Azure data is automatically sent to Salesforce to trigger events. In an example, Benioff highlights that Microsoft may monitor when a customer sign up for Office 365. Microsoft can detect that the customer has created an account, but hasn't installed the mobile app. Microsoft can generate an automatic rule to email a reminder to download the apps. The partnership also involves the Salesforce App for Outlook and the Salesforce1 for Office. Skype for Business and OneNote will also get integration with Salesforce Lightning. The Microsoft products will be shown on the Salesforce Lightning opportunity page, allowing you to call customers using Skype or see your saved notes. And even though the two companies are competitors in the CRM space, Salesforce data can also be integrated in Office Delve, which is powered by the Office Graph.